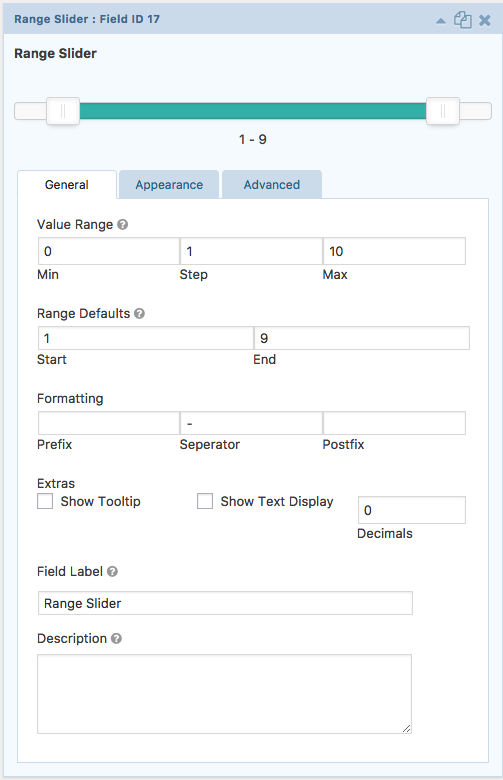 This plugin is an add-on for Gravity Forms that enables a Range Slider featured. The slider is a dual handle range with a ton of features, and it is as small, lightweight and minimal as possible, which is great for mobile use, with full touch support. Create a new Form in Gravity forms, or select an existing form. 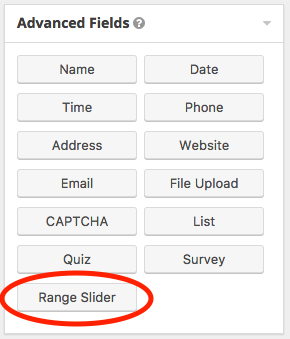 Open the Advanced Fields tab within the form editor, and select the Range Slider. Single Slider: Select whether to use a single slider or a range slider. Min: Minimum value of the range. Default minimum value is 0. Step: This is Step scale factor of the slider, default value is 1 and only allowing integer number unless minimum value is non integer number. Max: Maximum value of the range. Default maximum value is 100. Start: Set the value the first handle should start at. End: Set the value the last handle should start at. Prefix: A character value that will show in front of the values, typically used for adding a currency symbol to values. Separator: A character value that will show between the values, default value is a dash [ – ]. Postfix: A character value that will show after the values. 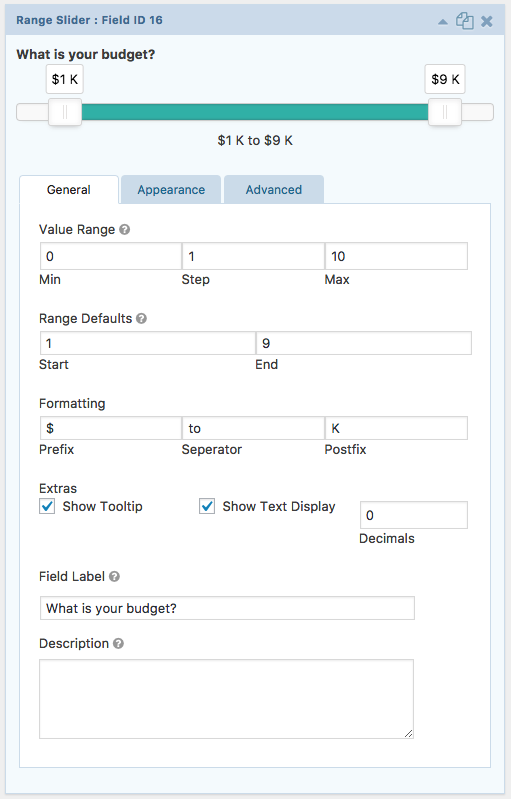 Show Tooltip: When active, display a tooltip above each slider handle with the value. Show Text Display: When active, display the current values of each handle below the slider. Decimals: Sets how many decimal points to show with the values. Hiilite | Marketing, SEO, Branding, Web & Graphic Design Example of the Range Slider with all option filled. What Else Can I Do with the GF Range Slider?